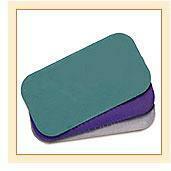 Rubber stamp pads: They are available in wide variety of sizes and are good choice for your stamping needs. Foam rubber pads: These pads are made of natural rubber (latex) or synthetic rubber in various weights and thicknesses. There are numerous foam materials in a various densities so that you can attain the feel and compression that your application requires. They can be laminated with an adhesive backing so that the padding can be installed as a component in your product. Crossover Pads: These are high tensile strength pads used to protect electrical or other cables, especially in the mineral processing and construction industries. These pads are made from various rubber compounds and are designed to be chemical, temperature and abrasion resistant. Rubber mattress pads: A rubber mattress pad is a pad or a thick sheet used for offering extra cushioning and support to a bed.